Really cool hostel, loved the front lawn area. 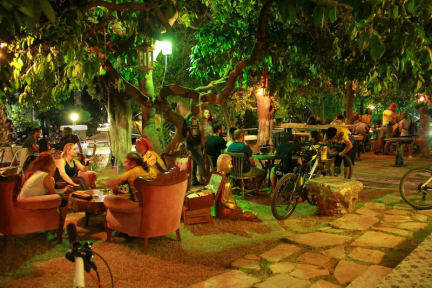 Great Hostel and atmosphere overall, including their bar-cafe. Loved my stay, location is amazing. They let me into the room early- which was great after an over night bus! Only downfall is that the bathrooms needed a good clean. Rooms were clean and big bunks. Very funky relaxed feel, breakfast was yum too. The staff was super helpful and the breakfast was good. The rooms were clean but the bathrooms were lacking cleanliness. The showers wouldn’t work half the time. It was nice that they had a cafe but the live music until 00:30 was too much. 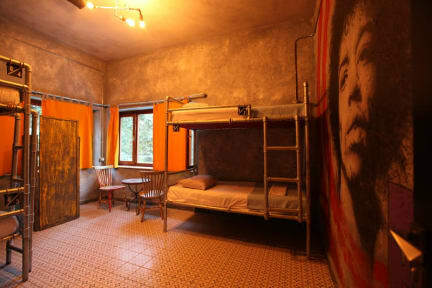 The hostel rooms were spacious and stylish and clean, equipped with lockers for valuables. The bathrooms smelt and had thick brown grime stains purely from not being cleaned. Hostel staff were friendly but could be unhelpful at times. Over our two night stay we asked for towels three times and each time were told the laundry was coming within an hour but it never came. Music was loud but didn’t disturb our sleep, potentially because it was a Sunday/Monday night. Good location. Role Street was a cool place but more of a bar than a hostel. If you are in antalya for hiking and would like to go to bed early and wake up early I would not recommend role street but if you are in Antalya for night life its a really great place. I wish that the doors had locks on them though, because anyone from the bar or street could wander upstairs and go right into any of the rooms. Very noisy as it's a pub that played loud music till 1am. Bed shaky. Toilet very cramped and not clean. Staff can understand very little English and always misunderstood my message. Breakfast served at 9am - far too late. Wifi signal very unstable. It was without WiFi sometimes. ABSOLUTELY over rated.